Could your bite be causing problems? There are a few TMJ-related causes for tension headaches. Constant contraction of muscle fibers within a muscle, create tension, pressure or a tight feeling in the face and head, and constant tight muscle fibers prevent or reduce blood flow to that area. The body sends more blood to the areas and this can result an increase in general blood pressure to the muscles and head, sometimes referred to as vascular headaches. Clenching and grinding the teeth, which are TMJ symptoms, produce pain from the muscles in the head, which is a headache. Furthermore, there are 2 muscles in the neck that are attached directly to the covering of the brain, which can cause a direct headache. muscles are working extra hard to compensate for the unstable bite. A neuromuscular dentist can helpfacial pain problems by working with the source of the problem, the bite. He will stabilize and realign your bite so that the teeth, muscles, and joints all work together without strain. Having a ‘bad bite‘ (malocclusion) causes an imbalance in the jaw-to-skull relationship, which in turn twists the jaw into a strained position that refers pain to the muscles in the neck, shoulders, and back. A neuromuscular dentist understands that the bones, joints, muscles, and nerves in the face and neck have a complex relationship. He works to correct the bite, relieving strain on the jaw and the surrounding muscles. Once the bite has been aligned, resulting pain in many areas of the body disappears. If A neuromuscular dentist diagnoses the cause of your tinnitus to be an unstable or misaligned bite, he can work with the source of the problem by stabilizing and realigning the bite so that the entire jaw area works together without pain. Your bite will be back to its normal position, relieving the ringing in your ears that was caused by the misaligned bite. Neuromuscular Dentistry works to realign the bite, which also realigns the displaced disc. Once the jaw is realigned and the disc is back in place the clicking and popping sounds in the jaw stop and the muscles holing the disc in place can relax, alleviating the jaw, face, head, neck, back, and shoulder pain that resulted. A neuromuscular dentist can help alleviate jaw pain related to TMJ by realigning the bite. Once the jaw is back into its most relaxed position the surrounding muscles can also resume their natural function. A neuromuscular dentist uses state-of-the-art technology to determine if your symptoms are caused by malocclusion and if so, what your optimal jaw position is. 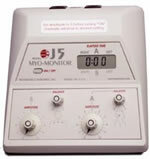 A neuromuscular dentist uses computerized jaw tracking instruments to record jaw movement, resting position, and path of closure. Electromyography is used to measure your jaw’s muscle function in both its stressed and relaxed positions, and will also measure the jaw-to-skull relationship to see if there is a structural imbalance. Sonography is used to record jaw joint sounds to detect any abnormalities. Additionally, x-rays of the jaw may be taken to help evaluate the condition and positioning of the joint. Relieve muscle spasm and pain.The immediate concern for neuromuscular dentists is to provide relief of your symptoms. The best way to do this is by using a technology called ULF-TENS. ULF-TENS stands for Ultra Low Frequency Transcutaneous Electrical Neural Stimulation, but don’t let this term intimidate you. Basically, ULF-TENS is a way to relax muscles with a gentle massage of the muscles. The rhythmic pulsing relaxes the muscles by increasing blood flow and pumping out waste products. ULF-TENS also helps with pain relief by stimulating the body’s production of endorphins, the body’s natural anesthetic. Some of the equipment used are featured below. 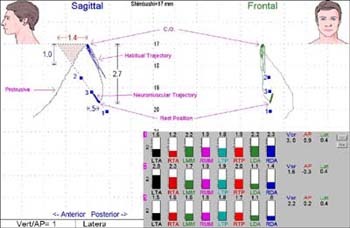 This helps neuromuscular dentists find a reproducible physiologic rest position or the position in which measurements of muscle activity is calmest. The ultimate goal is relaxed muscles and relaxed muscles are free from tension and pain and will function properly when chewing and speaking and smiling. Tense muscles can cause head,neck and back pain and this new technology may help relieve some of these symptoms. An orthotic or splint is constructed to fit over the teeth to help the muscles relax at the position as determined by the J5. Neuromuscular dentists can invest in technology that will precisely and quantitatively measure the activity in your jaw and neck muscles. They have found that calm muscles are “happy” muscles and are free from pain. They can determine by watching the muscle activity the most comfortable position for your jaw. They can track your jaw to that position and capture that physiologic rest position. This will allow them to make an orthotic in that position to allow your muscles to relax and heal. Which allows you to be comfortable with your new jaw position. After a series of adjustments on the orthotic as the joint heals, symptoms start to resolve.